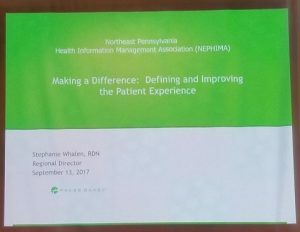 Welcome to the Northeast Pennsylvania Health Information Management website. NEPHIMA quarterly luncheon was held on September 13, 2015 at The Café an American Bistro. After registration a business meeting was held, minutes will be sent out with the next quarterly meeting announcement. Meeting dates to put in your calendars include November 8, 2017, March 7, 2018, and June 13, 2018. Ed Roman, Present and Education asks is anyone has vendors they would like to see come do a presentation to please let him know via e-mail vintmxer@aol.com. Presentation included a presentation by Joe Godish, Regional Sales Manager of Intellis. Joe reviewed the list of qualified professionals that would help benefit healthcare businesses in reduction of expenses, streamlining operations, identifying opportunities and improve fiscal performance. For more information on what Intellis can do for you contact Joe Godish at 215-919-8660 or jgodish@intellisinc.com. Also visit their website at intellisinc.com. Joe’s presentation was followed up by Ian Diener, MD, the CMO of Intellis. 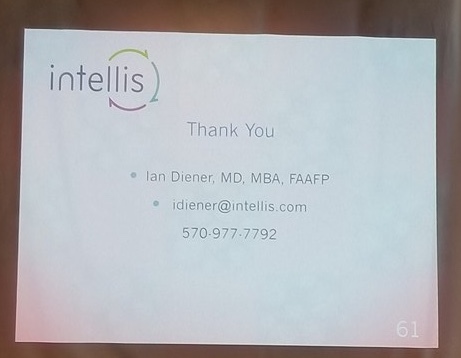 Dr. Diener did an excellent presentation on how intellis can help improve physician documentation in a post ICD-10 implementation. Afternoon presentation was presented by Stephanie Whalen, RDN, Regional Director of Northeast Territory of Press Ganey. Stephanie gave an overview of how Press Ganey can help with Pay for Performance by knowing how you score with the services you offer. For more detailed information on how you can benefit from Press Ganey for your patient satisfaction surveys contact Stephanie.Whalen@pressganey.com. There were a total of 4.0 CE hours available for the day. Next meeting is scheduled for November 8th at the same location. Hope to see you there.